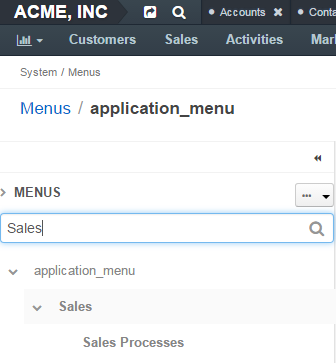 A menu may be multi-level like, for example, a default OroCRM and OroCommerce Management Console main menu. The child menu items are nested under parent menu items (e.g. Accounts, etc are nested under the Customers). Menu items on the same level of hierarchy may be visually separated by a divider that looks like a horizontal line. Dividers help you logically organize menu items. Some menus do not support displaying dividers (on a particular level in the tree, or in general). 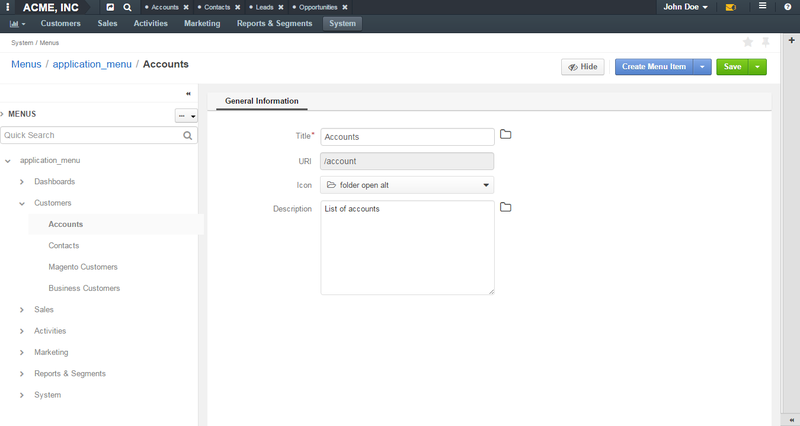 For example, if you add a divider to the top level of OroCRM and OroCommerce Management Console main menu (application_menu), the divider is not displayed. To view and edit menu contents, click on the menu name or on the View icon in the corresponding row of the menu list. On the page that opens, the menu item tree is shown in the left panel. Center is reserved for the menu item configuration. To minimize or maximize the left menu panel, click a double arrow on the top right of the panel. To expand / collapse a parent menu item, click an arrow in front of it. 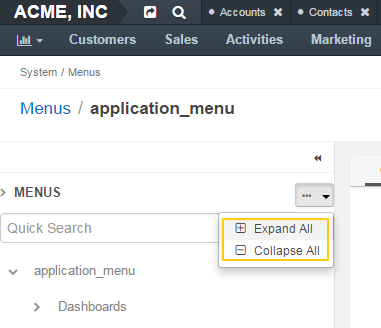 To expand / collapse all menu items, click the ellipses drop-down menu on the top right of the left panel and click Expand All or Collapse All. You can change the position of an item / divider in a menu by dragging and dropping it in the left panel. You can change the order of menu items at the same level as well as move an item / divider to the higher or lower level. If an arrow points to the place between items, that is where the moved item will be placed. If and arrow appears in front of a menu item, then the moved item will become a child of the item that the arrow points to. In the left panel, click a menu item which will be parent for the menu item that you create. Click Create drop-down on the top right and click Create Menu Item on the list. The created menu item will appear as the last one on the list of children of the same parent item. You can move it to the position that you need, as described in the Rearrange Menu Items / Dividers action description. Title—A name for the menu item. This is how this menu item will be represented in the menu. URI—An web address of the page or resource that this menu item opens. You can specify an absolute URI or one relative to the application URI (as specified in Application Settings in System Configuration). If this menu item serves as a non-clickable parent that does not link itself to any resource (like Customers in the default main menu), type #. Icon—From the list, select the icon that will denote the menu item. Sometimes menus (or menu levels) may not be supposed to display icons. For example, icons added to the first level of the main menu (application_menu) are displayed only when this menu is set to appear on the left. Description—Type a short but meaningful description of the menu item. Click Save to save your changes. If you wish to start creating another menu item right away, click Save and New on the top right. You need to reload the page to see changes. In the left panel, click a menu item which will be parent for the menu divider that you create. Click Create drop-down on the top right and select Create Divider. The created divider will appear as the last one on the list of children of the same parent item. You can move it to the position that you need, as described in the Rearrange Menu Items / Dividers action description. Some menus (or some menu levels) cannot display dividers. 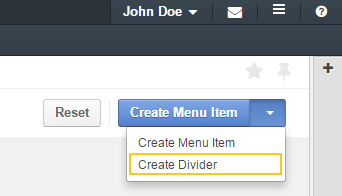 For example, if you add a divider to the first level of the main menu (application_menu), this divider will not be displayed. In the left panel, click a menu item that you want to view / edit. In the right part of the page, review / edit the menu item settings. 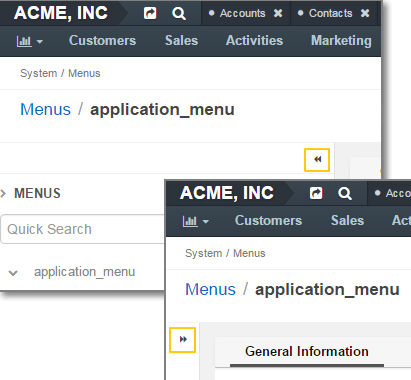 See step 3 of the Add a Menu Item action description for information about menu item fields. You cannot edit URI for default menu items. If you do not want one of the default menu items to be visible on the interface, you can hide it. If a menu that you hide has child items, they will be hidden too. You cannot hide non-default menu items. In the left panel, click a menu item that you want to hide. Click Hide on the top right. In the left panel, click a menu item that you want to show. Click Show on the top right. If a menu item that you want to show has a parent, it will become visible too. To quickly find a menu item, enter its name into the search field and click the Search icon, or press Enter. You cannot delete default menu items. When you delete a menu item that has child items, they will not be deleted but moved to the parent of the menu item that you delete. In the left panel, click a menu item / divider that you want to delete. Click Delete on the top right. In the Delete Confirmation dialog box, click Yes, Delete. In the left panel, click a menu name. Click Reset on the top right. In the Reset Confirmation dialog box, click Yes, Reset.